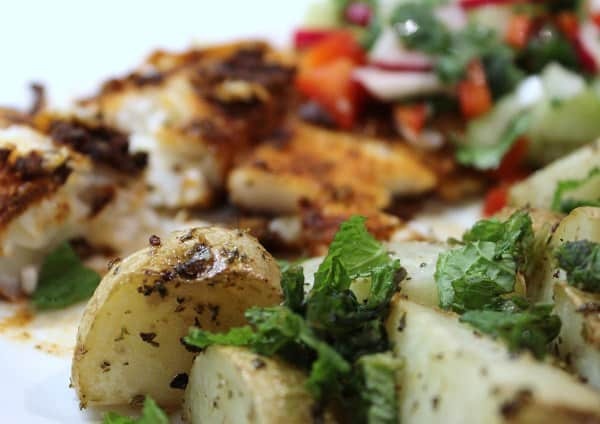 Remember that time I gave you that recipe for Blackened Tilapia with Radish & Cucumber Salsa and I said my next post would be the recipe for the side dish of potatoes to go with it? Yeah, that was like 6 weeks ago. Jeesh! What happened to the time? Life got crazy. Anyway, I’m finally giving you the recipe. 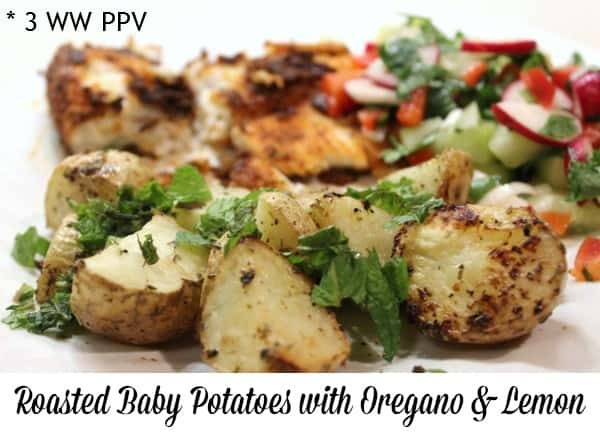 These yummy potatoes are called Roasted Oregano Lemon Baby Potatoes. 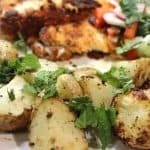 They are the perfect side dish to not only my Blackened Tilapia recipe, but pretty much any entree. In a 13x9 inch baking pan, toss potatoes with 1 tablespoon oil until coated. Sprinkle wih lemon juice, oregano, salt, garlic, and pepper; toss to coat. Roast 30 minutes; remove from oven and stir. Roast until light golden in spots and tender, about 15 minutes more. 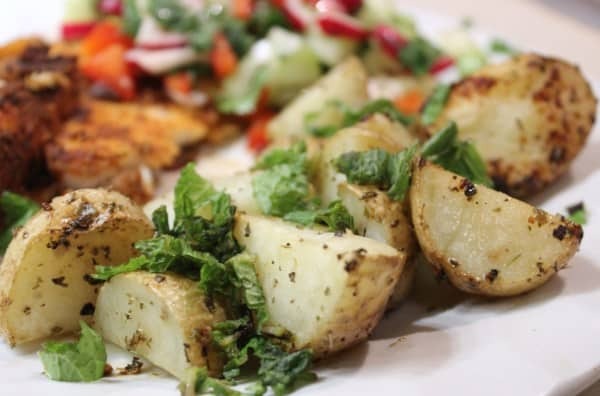 Transfer potatoes to a serving bowl and toss with lemon zest and remaining 1 teaspoon oil; serve with lemon wedges and garnish with mint, if desired. 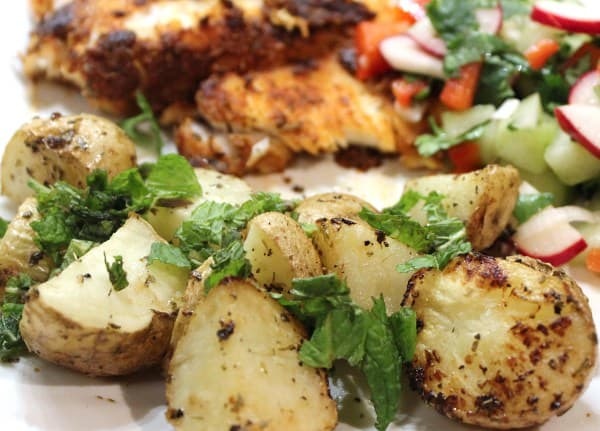 I’m not a big lemon fan, so I didn’t include the wedges of lemon when I made these potatoes. But if you like lemons, go for it. And because I didn’t have lemons, I also didn’t use the lemon zest. I did use the lemon juice though. I think that helps with the browning of the potatoes. These potatoes turned out really good! They were nice and crispy on the outside and very moist on the inside. 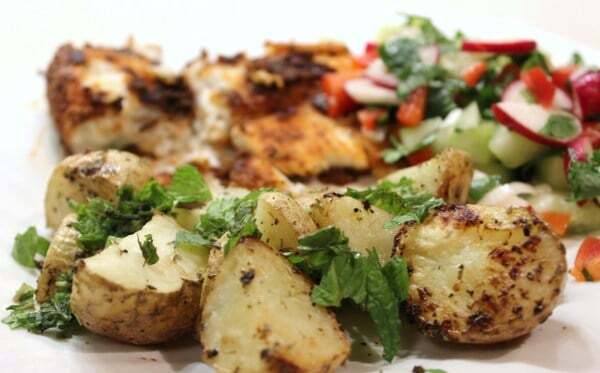 The sprinkling of the fresh mint on top gave these potatoes a little bit of an ethnic flair to them. Along with the blackened tilapia and the radish & cucumber salsa, it was delectable. Besides being delicious and very Weight Watchers friendly, only 3 Points Plus Value per serving, the best part about this recipe is how darn easy it is to make. So before you head out to the grocery store, print out this recipe. 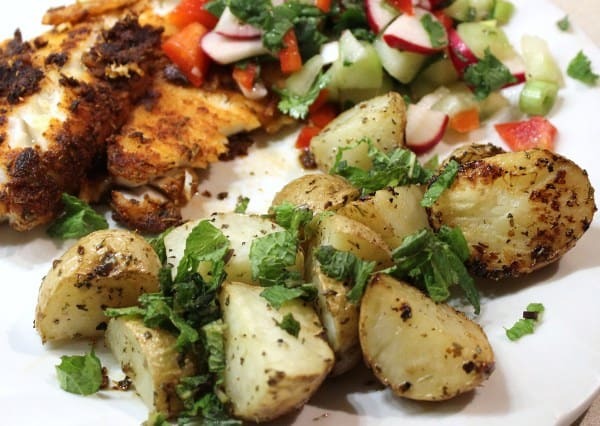 Go ahead and print out my recipe for the blackened tilapia with radish & cucumber relish too. You won’t be disappointed. It’s a very fresh and satisfying meal for the whole family.